In the modern era of constant football being easilyÂ accessibleÂ to anyone with an internet connection it is difficult to be able to talk about players that you haven’t already read about and even raved about yourself, so I’m going to make a point of trying to go for the more left-field choices, or the players who aren’t necessarily the stand out star for their respective side. TheÂ diminutiveÂ central midfielder has had a good year with Valencia and has grown on his early promise to put in elegant displays throughout the season. 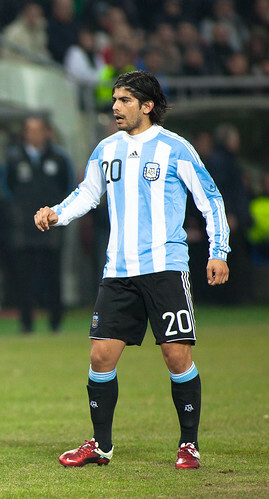 Part of current head coach Sergio Batista’s Olympic winning side in 2008 alongside Leo Messi, Sergio AgÃ¼ero, Javier Mascherano and a number of other players in the Argentinian squad, Banega has grown in stature over the last 18-24 months and was very unfortunate to miss out on the 2010 World Cup squad, but will be looking to make up for lost time at these Championships by cementing his place in Batista’s side. He could also seal himself a move away from the Mestalla during the competition due to Valencia’s ongoing financial difficulties. After rising to prominence and becoming the top scorer in the Copa Libertadores in 2007 with Cruzeiro the Bolivian forward secured aÂ â‚¬9 million move to Ukranian giants Shakhtar Donetsk but has stagnated since his move to Europe. Following redundant and fruitless loans at Werder Bremen and Wigan Athletic the 24 year old centre forward needs a good tournament to get his career back on track. Over 6 foot, he’s strong and pacy and leads the line well and has scored 8 goals in 22Â appearancesÂ for Bolivia. Will have a fight on his hands to secure his place from Ricardo Pedriel, who is another of the rare Europe-based players in the Bolivian squad, but, if he can recapture the form and promise of his earlier career, he could have a good tournament. Although Falcao has impressed massively for Porto over the last 18 months, particularly in the last season under Andre Villas-Boas, the 25 year old striker hasn’t been able to re-captured his form for Colombia. Part of the reason is Colombia’s more laboured build up play whichÂ necessitates Falcao to play with his back to goal more than he does for Porto, and this is a situation that Colombian coachÂ HernÃ¡n DarÃ­o GÃ³mez will have to rectify to try and enliven the Colombian attack that has struggled to score goals, in spite of having plenty of gifted attacking players in their squad.Â IfÂ GÃ³mez can find a way to get a spark into the Colombian side then this could be the tournament where the pacy, clever forward leads a very talented and young Colombian side further than in previous years. The man who came to prominence under current current Mano Menezes at Gremio still has question marks that still hang over him in some quarters, despite becoming one of club side Liverpool’s leading lights over the last 18 months. Tactically nuanced and disciplined, Lucas has developed physically and has become a strong tackler, competing well in midfield. Some people still accuse him of being overtly negative but since Kenny Dalglish took over at Liverpool, he has started showing a nous for forward movement and has started playing a more dynamic game.Â ConsistentlyÂ picked since Menezes’ appointment, this will be Lucas’ first major tournament for Brazil and he will be looking to build on his budding reputation and demonstrate there’s more to his game than he has been accused of in the past. Following a very successful first season in La Liga with Malaga where he got a return of a goal every other game, the young forward has been a player on a steady rise since he made his debut at the age of 17 for Aragua in his native Venezuela. Has been plying his trade in Spain for the past 3 years, first at Las Palmas, before Malaga paid â‚¬3.5 million for the centre forward.Â One of a number of good prospects in a Venezuelan squad that have very little pressure on it. Although still a minnow in terms of global football, the promising young players who can make their breakthrough in this tournament mean Venezuela could be an interesting team to watch. Having originally played deeper, in the last year he has played a more attacking role in the Leverkusen midfield, finishing top scorer for the side, but will play a more restrained role for a Chile side full of talent. Vidal’sÂ versatilityÂ means he can play anywhere in the midfield or at the back and will likely prove to play as a foil to more attacking players such as Mati Fernandez and Alexis Sanchez, but the Bayern Munich bound Vidal will be integral to a side that will look to play on the counter, in all three phases of defence, transition and attack. It’s amazing how often I forget Ever Banega exists, then when I remember my life seems to get more complete. Banega OG (pretty much) and Moreno missed a 1 on 1 at 1-0. Good choices, Rob.